Chennai is a place where dream homes come true. When the dream home’s essentials are perfectly met then the feeling is beyond words. When you wish to buy flats in Chennai, then there are a lot of things that come in your mind randomly and you actually take time to prioritize them. You will definitely want a location that is near your workplace or your kid’s school. Good connectivity and convenience in commutation is a very important factor while looking for residential homes in Chennai. Secondly, depending on the space that you wish to have, you would choose from 1 BHK flats in Chennai or 2 BHK flats and if you want a very spacious abode, then you can definitely check out 3 BHK flats for sale in Chennai. Apart from these, comes the amenities including a panoramic view of lush green landscaping from your home would be a soothing visual delight always. Amarprakash Builders has created a lifestyle abode perfectly matching the perfect home concept desired by you. Known to deliver unique lifestyle options, Amarprakash Temple Waves guarantees a vibrant living with a touch of tradition and style. The apartments are filled with lush green surroundings and the limelight is on the 70 % of enthralled landscaping nestling the elegant and stylish collection of homes. The concept of happy living definitely denotes Temple Waves because of the perfect lifestyle experience to anyone and everyone who choose to reside here. If you want to nurture your kid’s childhood in the best way then relax and step into Temple Waves. 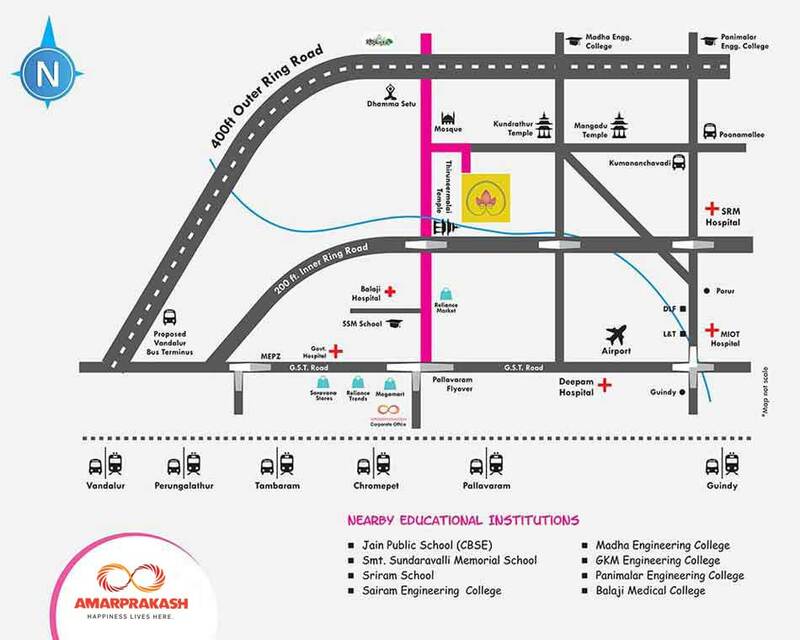 You would be interested to know that this is a unique project, one of its kinds in Chennai that promises to fulfill every need of your child. Apart from providing the best of luxury flats for sale in Chennai in a picturesque locality near Chrompet, the major advantage here is for children. A galore of amenities for the little ones is meant to nurture their education needs, playful moments and artistic talents. By providing a safe and secure amenity zones for children, their childhood is treasured the best way. In this mechanical world when parents hardly get time for their young ones because of work related commitments, the gated community assures that every child will be best taken care of. This gated community offers homes starting from 1 BHK flats, 2 BHK and 3 BHK lifestyle options and promises a galore of facilities to kids residing here by way of excellent schooling facility, engaging play area and creative sports zones. Temple Waves come with 66 Incredible Amenities reflecting Happiness and Bright Future of your Kids….